One of the spiritual practices we’re supposed to take on during Lent is prayer. But if you don’t normally pray the rest of the year, that can be a real challenge. Silence is hard for me. Prayer has always been a struggle and meditation all but impossible. My mind goes 100 mph 99 percent of the time, so whether it was Mass, trying to pray at home, or attempting meditation, I just couldn’t get myself to focus on God or make progress in my spiritual life that way. I thought that’s just my struggle — that I “couldn’t” pray. But it turns out that my concept of prayer was all wrong. “For me, prayer is a surge of the heart; it is a simple look turned toward heaven, it is a cry of recognition and of love, embracing both trial and joy,” St. Thérèse of Lisieux said — and she was a spiritual master and one of only four female doctors of the Church. No words are necessary because prayer takes place in our hearts, not our mouths. How many times have we said a prayer like grace before a meal or a Hail Mary and not really meant it? If you struggle with structured prayer as I do, it’s hard to think that saying certain words is really worth my time. It felt too empty to count as talking with God, so I struggled to see the point. But when I found that the Catholic Church doesn’t define prayer as spoken words or perfect silence, I found the concept of praying to be much more approachable. I changed what I thought I needed to do to be in contact with God. It turns out that I didn’t need to be the one speaking at all, as long as my heart and mind were pointed toward God. When I first started practicing my faith again, I couldn’t get enough of Bishop Barron’s homilies in podcast form. I listened to them while I did daily tasks and let my mind and heart process what he was saying. I learned about God and drew closer to God just by listening to Bishop Barron had to say about Him. Now, I’ve found other great podcasts to mix it up a bit, too, including Ask Father Josh, The Catholic Feminist Podcast, and Abiding Together podcast. When I listen to these podcasts, I am reminded of God’s presence in the world without needing to say a word. I think the same can probably be said about spiritual reading, too. It doesn’t have to be the Bible — any book can work if it prompts us to turn outside of ourselves and recognize Someone greater than ourselves at work in our lives and in the world. It doesn’t have to be Gospel or praise & worship music (although it certainly can be!) to get your heart in a state of thinking about the spiritual life. 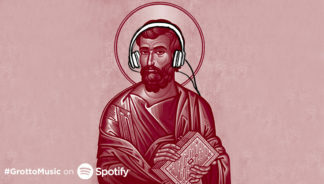 One of the things I love about the Grotto Music playlists is how they are an invitation to get to know a saint or feast day better through music inspired by the life of that person or the legacy of the work they’ve done in the world. There are songs that inspire a spiritual journey for Lent and joyful music for Easter. If reading isn’t your thing, music can have a powerful effect that brings your heart to closer to God through powerful lyrics and beautiful melodies. Taking a walk in nature is one of the best ways to take a step back from all the stress and work in your life. Experiencing awe — which we commonly experience in nature — is one of the secrets to true happiness. But what is awe, really, if not awe of God? And even if you can’t get outside regularly (or you live in a climate where being outdoors is not always desirable, like I do), there are other ways to experience awe in God’s creation. I love to watch the Planet Earth/Blue Planet series from BBC. I love how it changes my perspective on the world and prompts me to wonder how the Earth can be so beautifully designed. When I watch Planet Earth or walk outside on a beautiful day, my mind goes to God. My heart can’t help but be filled with wonder, awe, and gratitude — and it feels more like a prayer than saying a half-hearted Hail Mary. When we encounter other people with an open heart, it’s easier to see God in them. When we take time to be with people who are too often forgotten, it’s even more powerful. And when see suffering and injustice up close and personal, it prompts us to turn to God. We might ask, Why? Or, What can we do about this? Or, Please help! And all of those reactions are prayer. It’s true, that our prayers aren’t going to “convince” God to intervene in the world with a miracle. But turning our hearts to God changes us. That’s the amazing thing about prayer. The next time you’re doing volunteer work, or even just encounter a person asking for help on the street, think about letting your heart turn to God and ask for help doing the right thing. This simple prayer will help us reach toward God and our efforts to make the world a better place will go much further. So if you want to grow spiritually but you’re intimidated or even turned off by the idea of traditional prayer, have hope. Prayer doesn’t have to mean decades of rosary beads or silent adoration or kneeling by your bed at night. It just means turning your heart toward God. And the more we do that throughout our week, the more progress we’ll make. I’ve found it’s worth trying to add prayer, even in the non-traditional sense, to my day as much as possible. With a heart turned to God, I’ve found a deeper peace and greater joy than ever before.